A second use of finasteride is in the treatment of male pattern baldness. The conversion of testosterone to DHT in advancing years leads to thinning of hair in men. Inhibition of this conversion was envisioned as a possible baldness treatment. After finasteride was shown to be safe and effective in the treatment of BPH, a lower dose formulation was studied for treating male pattern baldness. The trials were a success, and Propecia (1 mg/d) was the result. Although finasteride preferentially inhibits the type II enzyme, it is believed to be the peripheral type I 5a-reduc-tase that is being targeted for the baldness treatment. Dutasteride is also being investigated for use as a baldness treatment. An important warning for the use of both finasteride and dutasteride is that pregnant women should not handle or in any way be exposed to the active ingredients of these drugs. Exposure to either of these 5a-reductase inhibitors could cause abnormalities of a male baby's external genitalia. Saw palmetto (Serenoa repens) extract is an herbal product used to treat BPH, and it has been suggested that the effects may be attributed to a constituent of the extract with 5a-reductase inhibition, but other mechanisms have also been proposed.136 Further studies and identification of a specific component that inhibits 5a-reductase are necessary. Figure 25.25 • Comparison of 5a-reduc-tase action on testosterone and finasteride. 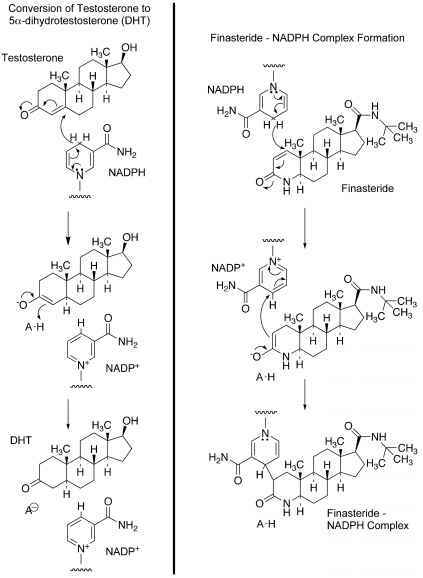 This scheme is an oversimplification of the exact mechanisms, but it indicates that when finasteride is bound at the active site of 5a-reductase, NADPH is positioned closer to C1 of finasteride than to the normal C5 of testosterone, leading to essentially irreversible inhibition. Selective androgen receptor modulators or SARMs are the newest developments among the potential androgen drugs. A parallel to the SERMs and SPRMs, SARMs are molecules that have differential actions at ARs in distinct tissues. The lead compounds furthest along in development are non-steroidal AR ligands that have anabolic properties in muscle and bone, with only partial agonist action in the prostate. 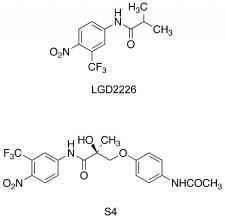 Two of these lead compounds, LGD2226 and S4 (Fig. 25.26) are in phase I/II trials, with potential to treat age-related muscle wasting and osteoporosis, in both men and women. As can be seen from Figure 25.26, S4 shares structural similarities with the antiandrogen bicalutamide. become very important in modern medicine, especially for their anti-inflammatory effects. Aldosterone and, to a lesser extent, other MCs maintain a constant electrolyte balance and blood volume. The GCs have key roles in controlling carbohydrate, protein, and lipid metabolism. Figure 25.27 • Biosynthesis of Aldosterone, hemiacetal form hydrocortisone and aldosterone. large amounts of 11-deoxycorticosterone will be produced. Because 11-deoxycorticosterone is a potent MC, there will be symptoms of MC excess, including hypertension. When 17 a-hydroxylase activity is low, there will be decreased production of testosterone and estrogens as well as hydrocortisone. Although the details are not completely known, the 39-amino acid peptide ACTH (corticotropin) produced by the anterior pituitary is necessary for the conversion of cholesterol to pregnenolone. ACTH acts at the ACTH receptor, a G-protein-coupled receptor that activates adenylyl cyclase, leading to increased cyclic adenosine monophosphate (cAMP) levels. Activation of the ACTH receptors has short-and long-term effects on steroidogenesis. The short-term phase involves an increase in the supply of cholesterol for use by cytochrome P450scc in the formation of preg-nenolone. The long-term effects are caused by an increased transcription of steroidogenic enzymes.142 An overall result of ACTH action is increased synthesis and release of hydrocortisone. Hydrocortisone then acts by feedback inhibition to suppress the formation of additional ACTH (ACTH is discussed in more detail in Chapter 27). The release of the primary MC aldosterone depends only slightly on ACTH. Aldosterone is an active part of the an-giotensin-renin-blood pressure cycle that controls blood volume. A decrease in blood volume stimulates the kidneys to secrete the enzyme renin. Renin, in turn, converts an-giotensinogen to angiotensin, which stimulates the adrenal cortex to release aldosterone. Aldosterone then causes the kidneys to retain sodium, and blood volume increases. When the blood volume has increased sufficiently, renin production decreases, until blood volume drops again. (b) reduction of the 3-one to give 3a-ols, and (c) reduction of the 20-one to the corresponding 20a- and 20^-ols. 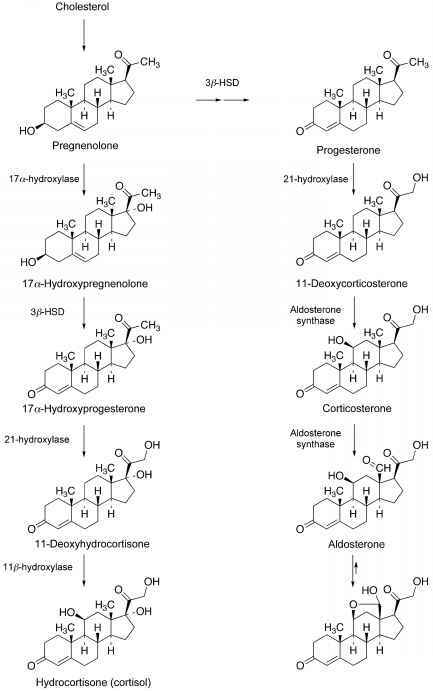 These are the same steps that are involved in progesterone metabolism. The two primary metabolites are tetrahydrocortisol and tetrahydrocortisone and their conjugates. The cortols (20a and 20j3), cortolones (20a and 20j3), and 11^-hydroxy-etiocholanolone are some of the minor metabolites of hydrocortisone (Fig. 25.28). 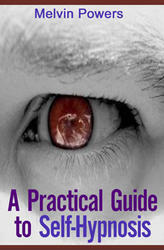 The adrenocortical steroids permit the body to adjust to environmental changes, to stress, and to changes in the diet. Aldosterone and, to a lesser extent, other MCs maintain a constant electrolyte balance and blood volume, and the GCs have key roles in controlling carbohydrate, protein, and lipid metabolism. Figure 25.28 • Metabolites of cortisone and hydrocortisone. concentration. Simultaneously, aldosterone increases potassium ion excretion. 11-Deoxycorticosterone is also quite active as a MC. Similar actions are exhibited with hydrocortisone and corticosterone, but to a much smaller degree. Aldosterone controls the movement of sodium ions in most epithelial structures involved in active sodium transport. Although aldosterone acts primarily on the distal convoluted tubules of the kidneys, it also acts on the proximal convoluted tubules and collecting ducts. Aldosterone controls the transport of sodium in sweat glands, small intestine, salivary glands, and the colon. In all of these tissues, aldosterone enhances the inward flow of sodium ions and promotes the outward flow of potassium ions. The GCs have many physiological and pharmacological actions. 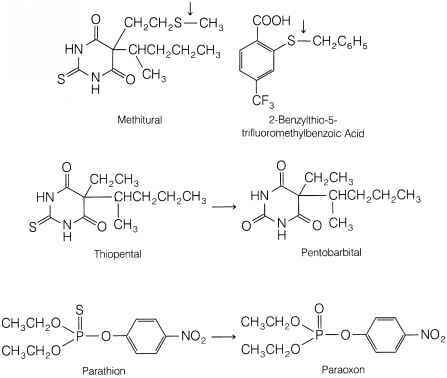 They control or influence carbohydrate, protein, lipid, and purine metabolism. They also affect the cardiovascular and nervous systems and skeletal muscle. They regulate growth hormone gene expression. In addition, GCs have anti-inflammatory and immunosuppressive actions that arise through complex mechanisms. GCs stimulate glycogen storage synthesis by inducing the synthesis of glycogen synthase and stimulate gluconeo-genesis in the liver. They have a catabolic effect on muscle tissue, stimulating the formation and transamination of amino acids into glucose precursors in the liver. The catabolic actions in Cushing syndrome are demonstrated by wasting of the tissues, osteoporosis, and reduced muscle mass. Lipid metabolism and synthesis increase significantly in the presence of GCs, but the actions usually seem to depend on the presence of other hormones or cofactors. A lack of adrenal cortex steroids also causes depression, irritability, and even psychoses, reflecting significant effects on the central nervous system. GR complexes may activate or repress the genes to which they associate. Repression in particular may have an important role in GC anti-inflammatory actions. GCs inhibit the transcription of genes encoding cytokines such as interferon-y, tumor necrosis factor-a (TNF-a), the interleukins, and granulocyte/monocyte colony-stimulating factor, all factors involved in the immune system and inflammatory responses.142 GCs inhibit the production and release of other mediators of inflammation, including prostaglandins, leukotrienes, and histamine. In addition, GCs inhibit the expression of the gene encoding collagenase, an important enzyme involved with inflammation. Clocortolone pivalate tention activity is usually undesirable, the drugs are classified by their salt retention activities. As illustrated in Figure 25.29, the adrenal cortex hormones are classified by their biological activities into three major groups.